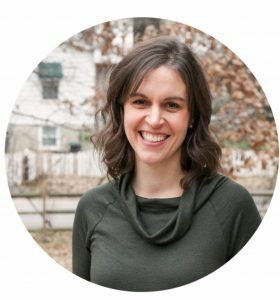 I saw this recipe on Money Saving Mom‘s menu plan last week, and decided to give it a try. As I said yesterday, I’m sort of a slacker when it comes to making homemade desserts (especially in the summer when I don’t much feel like turning on the oven), but this looked so easy, I thought even I could get motivated to make it. The first batch I made was just ok…it had sort of a weird flavor, and after a bite or two, I realized that the problem was a super-strong vanilla taste. The recipe called for two teaspoons and that much vanilla in an unbaked product produces a really unpleasant vanilla overload. So, for the next batch I made, I reduced the vanilla to 1/2 teaspoon, and the results were waaay better (and cheaper, too! Vanilla’s kind of expensive). This recipe is fairly customizable…you can use any type of nut butter you like, and you can vary a number of the other ingredients too. And since these are so simple to make and don’t require any heat, they’re a great project to do with kids. First, mix the nut butter, honey, and vanilla together. As I’m sure you know, measuring nut butter is kind of a pain since it sticks to everything. 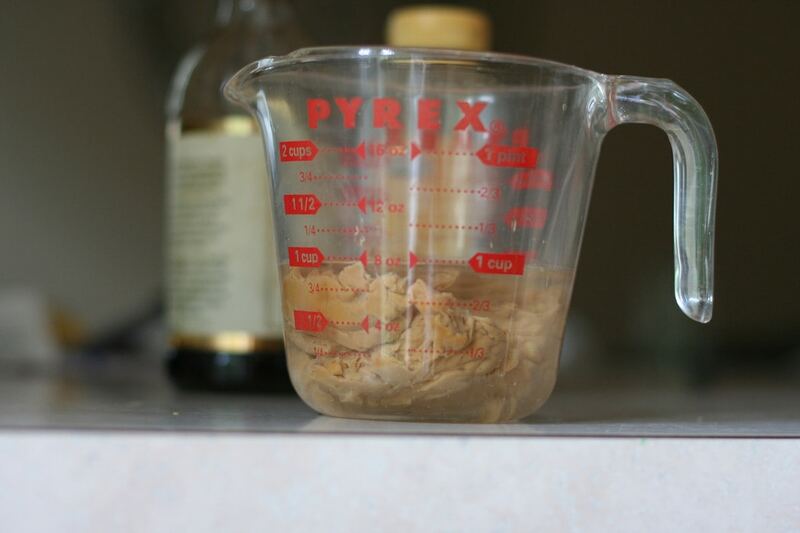 To make this simpler and less messy, I put 1/2 cup of water into a measuring cup, add peanut butter until the water level reaches 1 cup, drain the water, and dump the peanut butter into my bowl. This process looks exceedingly unappetizing, but it’s very not messy. So! 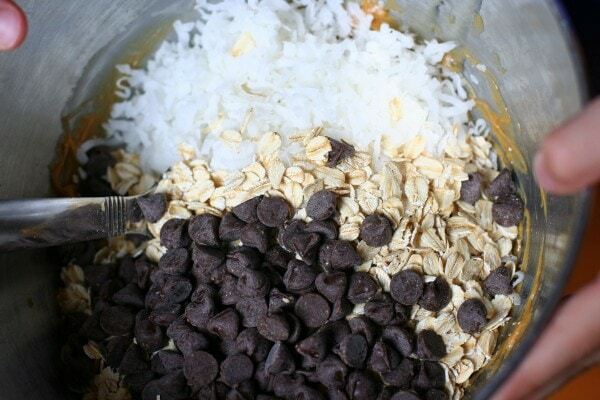 Add the coconut, chocolate chips, and oatmeal to the peanut butter mixture. If you have mini chocolate chips, I’d use those because they distribute better. Regular chips work fine too, though. Stir until it’s all nicely combined. Place the bowl in the refrigerator for a half hour to make the dough easier to handle. Take a tablespoon of dough, compress it into a ball shape, and roll it between your hands until it’s smooth. 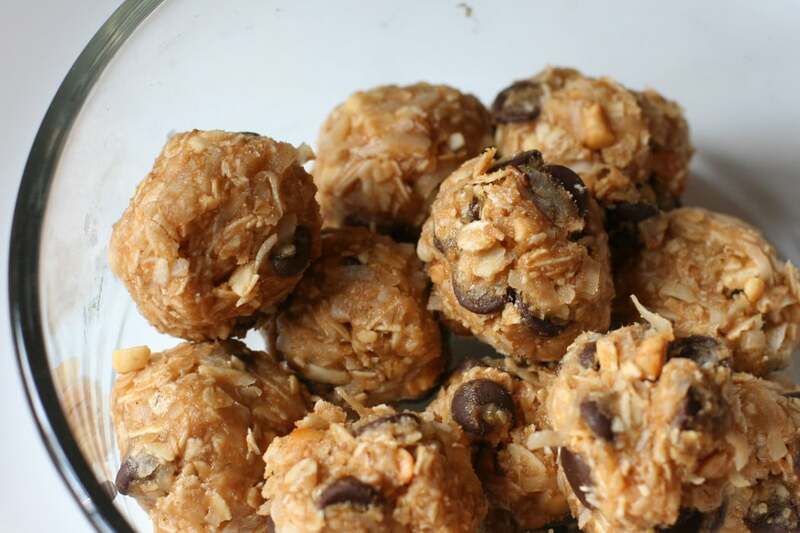 If your balls are still pretty sticky, or if you just want to make them look fancier, you can roll them in coconut or wheat germ. And that’s it! You just eat these unbaked…it’s sort of like eating peanut butter/oatmeal cookie dough, except without the worry of raw eggs. My kids love them, and as far as desserts go, I feel pretty happy about them eating these. They may not be health food, but they’re definitely more nutritious than a lollipop. I store ours in the fridge, but I don’t know if that would be completely necessary in the winter or in a colder air-conditioned house. 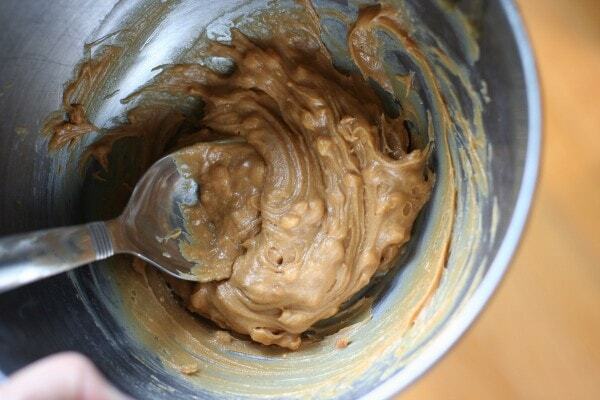 In a medium bowl, stir together nut butter, honey, vanilla, and salt (if using). Stir in oats, coconut, and add-ins. Refrigerate mixture for 30 minutes. To make the balls, scoop out about a tablespoon of dough, press to compact, then roll into a ball. Repeat with remaining dough. I made these this week too. We don’t really like coconut, so I put in a cup of finely chopped pecans instead. They were so good! Ooh, I bet that’s tasty! I love pecans. That is a really great tip for the peanut butter, thank you! I actually avoid recipes that call for peanut butter because of that. I have a measuring device that pushes the stuff out of the cylinder, but I lost the pusher part. Which was important. So I will try this. These are perfect when you don’t want to use your oven! Thanks for sharing! 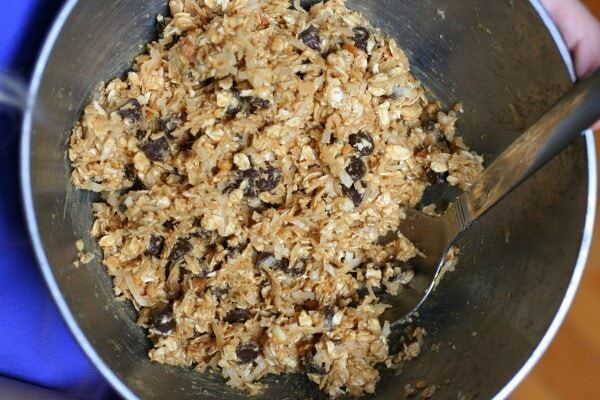 A few weeks ago, I tried MSM’s Baked Oatmeal recipe! It was wonderful! Oh, I make these things ALL of the time! I use gluten-free oats and form them into bars and wrap in plastic. They make great on-the-go breakfasts and snacks. Also, you can boost the nutritional value a little bit by adding some powdered milk (but not too much) with the bonus being that it helps to firm up the bars just a tad as well. You can also weigh the peanut butter. I used to use the water displacement method for nut butters and shortening, but when I got a decent kitchen scale I switched to weighing. It’s a bit easier for me and one less dish to wash.
Did you use the peanut butter that you have to stir or the regular kind? I use organic and you have to stir it and its kind of runny, so I’m wondering if I could make these with it. I’m sure you can use organic nut butter with possibly having to add a little more oatmeal to absorb the extra liquid. Also, to keep organic nut butter thoroughly mixed – turn the whole jar out into a large pan, stir it well, put back in the jar and put in the refrigerator. Let it warm up about 15 min before using. Got this hint from a manufacturer’s rep when we had a health food store. I am *so* making these soon. Either this week because they look good and I have all the ingredients, or next week when my pregnant sister is in town (what pregnant woman doesn’t love some sweet treats! ), or later next week as a treat to eat in the car on our long road trip we have coming up. Or maybe for all three!!! THANK YOU for the awesome peanut butter measuring hint! I want to try these — they look awesome! Another tip for measuring peanut butter or even honey is to lightly spray the inside of the measuring cup with Pam or a cooking spray. The peanut butter/honey slides right out for me! I also have this tool that is a cylinder and made specifically for measuring liquids. When you put PB in it you just push it out (like a syringe) and it works perfectly! Here’s a recipe my husband (the cook at our house!) uses to make your own vanilla extract: put half a cup of hot vodka in a jelly jar with whole vanilla bean split lengthwise. Shake daily and can be used within a week and will keep forever. I don’t know if this is any cheaper, but my husband had both things on hand already. He got this recipe from Cook’s Illustrated (America’s Test Kitchen). You can use really cheap vodka, so I think it does end up being cheaper. haven’t gotten around to trying it myself, although I did buy some vanilla pods from my local fair trade shop so I really should get a move on and do it. Ooh, these look delicious! I bet my daughter would really love them. I’ll have to try these soon! If you get your vanilla at Sam’s Club, it will cost so, so much less! I get mine at Costco….so much cheaper at a warehouse club than at a grocery store! these looked like a great snack and we have two friends over today so I made them and they love them! So easy to make. Thanks! I’m so glad you enjoyed these! I’m sorry the original recipe had too much vanilla, I find the vanilla I buy always leaves me wanting more vanilla flavor so I always add quite a bit. Maybe I’ll make a note in the recipe about that, so thank you for mentioning it! I must have really strong vanilla or something. Or maybe you have really weak vanilla. I use the Madagascar vanilla from Costco, if that helps! And no worries…my kids ate the first very vanilla-y batch without complaining at all. These sound yummy and also a great recipe the kids can help out with (especially because you don’t need to use the oven). I made these this morning – YUM!! Thank you for sharing the recipe. I made mine with almond butter, and they are delicious…next time I’ll try peanut butter (a little cheaper!). I made these yesterday. They were a hit. Thanks!! I used sunflower butter and added some finely chopped walnuts with the choc chips and coconut. I made these last night after reading about them. I didn’t have chocolate chips so I made them with raisins and I love cinnamon and added cinnamon to them. They are so yummy!!! Thanks for sharing. Defintely going to make these! Okay, I just made these and they are delicious! I made a few small changes…namely adding about 1 tbsp of ground flaxseeds for extra nutrition and cutting back on the mini chocolate chips to about 1/3 of a cup. There were still plenty of chocolate chips in the mix! Next time I’ll probably double this since it didn’t make a ton, and these will be great to have in the fridge for quick snacks. My 2-year-old and I are both in love with them, and I’m sure my husband will be once he tastes them! There’s a version of these in Missy Chase Lapine’s Sneaky Chef cookbook which features sweet potato puree. Believe it or not, you can’t taste it at all. My son (10) calls them “cookie dough balls”. I don’t subscribe to the idea of hiding healthy food inside of unhealthy food, so he knows what’s in them and still likes them. I made some last week and my husband and kids loved them!!! I was thrilled. I added some ground walnuts and ground flax seed. These are perfect for there mid day snack at school. Thanks so much for posting this recipe. I’m not a fan of nut butters – but I do love Nutella – I wonder if I could substitute that or maybe do 1/2 peanut butter, 1/2 Nutella? Little man does love peanut butter so I’ll try the original recipe on him first. Thanks for the idea! I think Nutella would work! The only thing that might be a downside is that the combo of the sweet Nutella and the sweet honey may make the balls too sweet. I wouldn’t add chocolate chips or any other sweet add-ins if I used Nutella. I’d suggest using less honey, but I worry that the balls wouldn’t stick together properly then. You could also try brown rice syrup instead of honey to make it less sweet, especially if you wanted to try the Nutella. I did this last weekend, and they’re delicious. There were great, only lasted 1 1/2 days in my house my husband devoured them, I used regular peanut butter. I did 1/4 cup mini choc chips and 1/4 cup salted shelled pumpkin seeds. Amazing! My daughter’s friends wanted to trade her snacks at school. My poor son didn’t even get to taste one:( Must make more today. Great recipe. another good way to get peanut butter and even honey out of measuring cups is to spray a non-stick cooking spray or lightly coat the measuring cup or dish w/cooking oil before you add your peanut butter or honey. I’ve been making a version of these for quite some time. I mix it up often using whatever sounds good…peanut butter, sunflower butter, almond butter and then adding in variations of whatever sounds good…cocoa powder, cinnamon, dried cranberries, coconut, chocolate chips, honey, chopped nuts (especially cashews), vanilla, oatmeal, flaxmeal, ground coffee, etc. I have even dipped them in melted chocolate to make it a little more like candy at times too. They are also great for people that need to be gluten free….with or without a food allergy people love them. I spray my measuring cup before I put sticky stuff in. I used agave instead of honey. I used coconut,chocolate chips,sunflower seeds,ground flax and vanilla bean paste. So good. 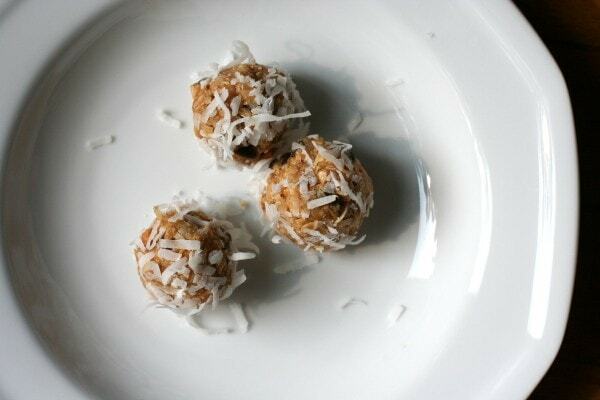 I want to try and make the energy balls but i am having a hard time finding unsweet coconut, did you use unsweet? Thanks. Adding a little coconut oil to the energy balls helps with shelf life and adds nutritious fatty acids to the mix as well!